If you ask a person who has used a Rust-Oleum Epoxyshield or Quikrete garage floor epoxy paint kit to give you a review, you will get a different answer almost every time. Many people do not have kind words for these kits. They complain of the epoxy paint peeling up fairly quickly or of the coating itself wearing out in places. There are times however when Rust-Oleum or Quikrete don’t always deserve the bad reviews that they receive. These kits of course are the ones you can purchase from your local home improvement center or online for $65 to $75. This one here is a good example from Amazon. They are water based, you generally have a choice of tan or gray colors, and they even have decorative paint chips to toss onto the surface. All of these kits will include some form of a citrus acid etch and cleaning solution for the concrete. So why are so many people unhappy and bringing the reputation of these epoxy paints into question? The answer lies partly in people’s expectations, their lack of knowledge on how epoxy paint works, and the marketing of the paint kits themselves. So why the problems with Rust-Oleum and Quikrete? When the decision has been made to upgrade the protection and looks of the garage floor, some don’t want to break the bank or are on a budget which is understandable. When they visit their local home improvement store to see what paint is available, they may be advised on the added benefits of epoxy instead. 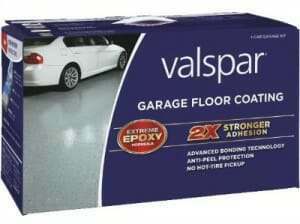 They are then pointed to the epoxy paint kits instead of the standard latex acrylic garage floor paint. Once they see the nice shiny picture on the box promising a beautiful epoxied floor that goes on with ease, they spend a little more money expecting the long lasting and durable coating that is advertised on the box. The other scenario is the online shopper looking for a deal on epoxy floor coating products. 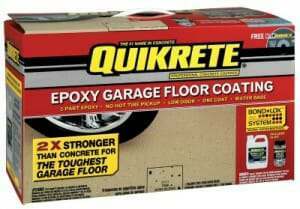 They find great deals online for these epoxy garage floor paint kits with all the promises of a beautiful epoxy floor for less than half the price of other epoxy systems. They then make the purchase not really knowing what they are getting. So, what are they getting? Both the Rust-Oleum Epoxyshield and Quikrete epoxy paint is an actual 2-part water based epoxy coating — one part is a tinted epoxide resin and the second part is a polyamine hardener. Both have approximately a 50% solids content by volume with the remaining being water. The water acts as a carrier agent for the epoxy and allows it to be applied very easily, just like paint and that is why they are marketed as such. What happens, however, is this water base evaporates as the epoxy cures and what you are left with is just over 50% of what originally went on the concrete. Actual dry film thickness is approximately 3 mils for the Rust-Oleum Epoxyshield product and 2.4 mils for Quikrete. Due to the amount of questions we have received, we want to update this article to include the Valspar garage flooring kit as well. It falls into the same category as EpoxyShield and Quikrete. The Valspar product is a water based 2-part epoxy paint kit that cures to a dry film thickness of 1.5 mils. Lowes generally carries this line, but you can find it here from Amazon and usually at a much better price. A better quality kit that is more expensive but doesn’t get as many bad reviews would be the Rust-Oleum Professional Series epoxy. The Professional series is solvent based instead of water based. These kits are more durable, they have a higher coverage rate, and they provide for a 4 to 5 mil dry film thickness. Just be aware that solvent based kits produce higher VOC’s upon application. 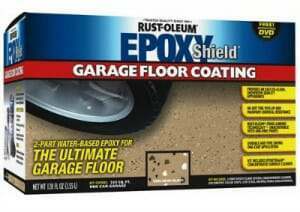 The best prices for Rust-Oleum Professional Garage Floor Epoxy can usually be found here from Amazon. 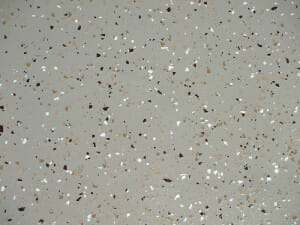 Best yet would be a higher quality epoxy that has up to 100% solids with no VOC’s to worry about. It’s more difficult to work with and you have a shorter period in which to do it, but when it cures, very little evaporates and what you have left is 100% of the product on your floor. As an example, epoxy paint is on average 2.5 mils thick when cured and 100% solids epoxy is 9 to 12 mils thick. Another thing to keep in mind is that the Rust-Oleum and Quikrete epoxy paint is a one coat product with a semi-gloss finish, where as commercial epoxy systems are a minimum of three coats with at least one of those being a glossy clear coat. This is what gives epoxy floors their shine and depth. So as you can see, there is a big difference between a one coat product such as the Rust-Oleum or Quikrete epoxy and the much thicker and more expensive multi-coat system of commercial epoxy floors. You cannot expect to get the same protection, durability, and shine from these simple one coat kits that you do from a higher quality commercial product. The big issue though is that many home owners are not aware of these differences in epoxy floors and expect the best from the lesser expensive kits. Another problem is poor preparation of the floor when these kits are installed. This is probably the biggest mistake that is made. The pores of the concrete surface need to be exposed in order for epoxy to mechanically bond to it. This is called profiling the concrete. Rust-Oleum and Quikrete both give you a citrus acid cleaning solution to use on the concrete to help expose these pores, but the problem is that it’s not always effective. Many times you need something stronger such as muriatic acid to etch the floor. A few drops of water on various spots of the floor can test this. If the concrete turns dark and immediately absorbs the water, then the concrete is profiled correctly. If it sits there without absorbing right away, the pores are not exposed and the epoxy will not bond well. Poor profiling of the concrete is what causes the delamination or peeling of the epoxy paint within a few weeks or months. The pores of the concrete must be exposed and be free of all oils and dust. It takes more work to prep the floor than it does to apply the epoxy paint. Poor floor preparation is the cause of most bad coatings. Can we recommend Rust-Oleum or Quikrete epoxy paint? 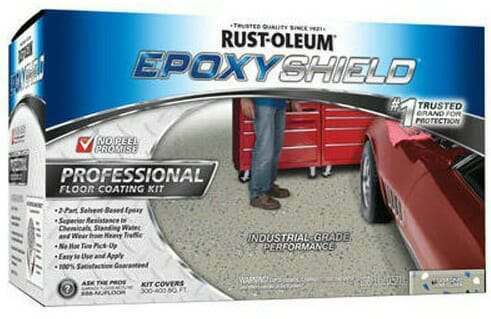 So, are the Rust-Oleum Epoxyshield and Quikrete garage floor epoxy paint kits truly bad? No, not necessarily. If you properly prepare your floor then you should be satisfied with the results as long as you are aware that what you are applying is not the same as a commercial epoxy coating. There are many people who have done just that and give great reviews about their floors. For additional protection and a longer lasting floor coating, you can purchase an optional second coat of clear epoxy which will enhance the look and prolong the protection of the floor by doubling the thickness. The average life expectancy of these floors is 3 – 5 years before they start to show their age and even longer if you apply a second coat of clear. Dollar for dollar, Rust-Oleum and Quickrete epoxy paint cannot compete with a commercial quality epoxy coating when you cost average your floor over years of service, but if you are on a budget, then these just might be the product you are looking for. In fact, there are actually more satisfied customers who have purchased these products and would recommend them again, than there are bad reviews. Just be sure that you know what to expect. I am wondering if I could use the Rust-Oleum EpoxyShield on a concrete floor that has vinyl tiles. The tiles are firmly adhered to the concrete floor. If we prep the floor with 120 grit sandpaper and wash it clean, does the epoxy stand a chance to adhere to this type of floor? Hi Rudy. Yes, the epoxy will adhere fairly well. However, you need to keep in mind that if the tiles have any type of pattern or relief cut into them, then it’s going to telegraph right through the coating. In other words, it’s not going to provide a smooth, seamless look. 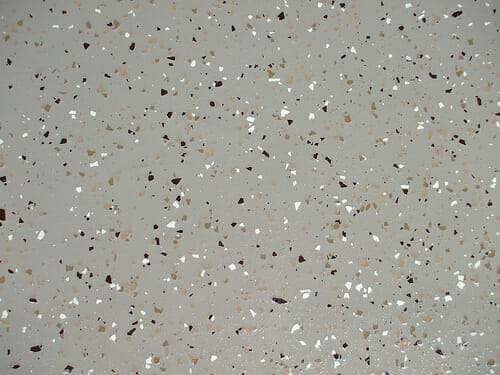 EpoxyShield is a low solids coating. Though it self-levels upon initial application, the wet film thickness of the coating shrinks as the water evaporates out during the curing process. It’s similar to what happens when you try to hide a blemish or nail hole when painting a wall. Once the paint dries, you can still see the defect. Hello Chris. A moisture barrier blocks moisture from coming up from underneath the slab. Sweating is caused from condensation. Relatively warm moist air comes in contact with the cooler slab and condenses making it wet. I suggest reading our article here on sweating slabs. If your slab sweats, a coating will not prevent it since it will always be the same temp as the slab. Questions and comments are moderated before they are published.